For most question types, you can also insert one image/video and one audio clip in Form View (though you can add more in Slide View). Just click Media or Audio on the ribbon. To switch to Form View, do any of the following, depending on your current view. Create a new form-based question. 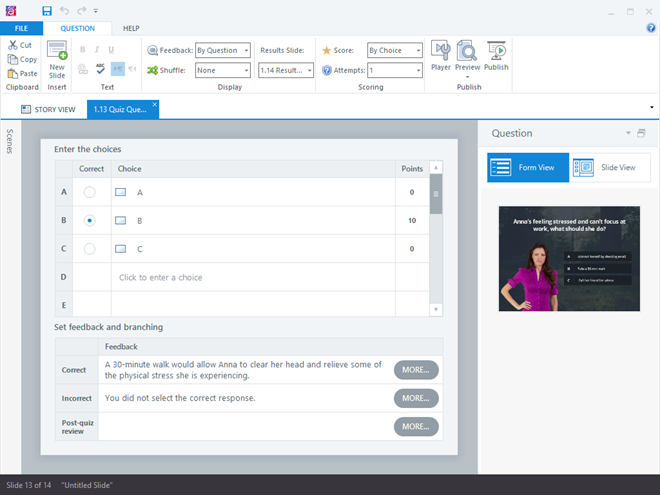 Double-click an existing question slide to open it in Slide View, then click the Form View button in the upper right corner of the workspace. Click the Form View button in the upper right corner of the workspace. For more control over the appearance of question slides and feedback layers, see Switching to Slide View.